I personally dont believe they are the same companies or have same parent. They are using technology from the same provider turnkeyfx.com and turnkeyfx clearly says all the service they provide for setting up or managing a forex brokerage. We have discussed it in length on this thread earlier on. Think of mobile phones for a second. One Plus, Motorola, Nexus and Sony use the same version of Android, they all look and feel the same (At the software level) except the hardware that they offer and the price that they charge for it. So does that mean One Plus, Motorola, Google and Sony are all owned by the same parent company ? Obviously we all know that they are different companies operating and serving different types of consumers. Its the exact same case with Finpro, turnkeyfx and turnkeyforex. The use the same technology provider which is turnkeyfx.com but they are different companies and you can feel the difference in their character by talking to their respective sales people. I wish finpro and turnkeyforex guys are reading this thread and do something about their potential brand identity issues here . Guys, get your MT4’s branded with you own logos. Because traders tend to link you with eachother and your logos are more important than your client service (no offience if you are reading this thread). In my personal opinion I absolutely prefer Coinexx followed by Finpro then turnkeyforex and last Lqdfx (in the exact same order of preference). all four are top notch brokers and they are doing amazing service to traders by protecting our interest and keeping the leverage levels intact and still offering amazing commissions and service to both US and non-US clients. And after ESMA following the footsteps of CFTC, its even more important for EU and US traders to have a few decent brokers like these. Keep the good work going guys… ! Some one who works for them told you this? Or just someone who uses them as a broker? I still use them as a broker. Thanks for replying. Might be true, might be hearsay. Excuse my ignorance, we have trader’s way listed as one of the trusted broker but when I go to their website, the footer says “All information on this website is not directed toward soliciting citizens or residents of the United States and the United Kingdom." Am I missing something? so watch this thread carefully. nationality/residence “neutral” in accepting U.S. clients. their access to the “normal” funds transfer mechanisms; again through U.S.
by restricting the usage of Cryptos to "funds transfer purposes only"
may vary”… Good Luck !! @HyperScalper & @whywescalp Yeah with CFTC clamping down on brokers and traders alike like a noose around their necks it is becoming an increasingly suffocating environment to trade peacefully in, especially for US residents. Take LMFX for instance. Got busted for taking in US clients despite having listed rather explicitly so that they don’t do so. That’s what kept me from signing up with Trader’s Way too. I couldn’t find a solid ground to rely on them especially with what happened with LMFX. Of course it is not the only stooge on the list we’ve got other brokers as well that are falling prey to CFTC’s hunting practices. The matter of fact is that with CFTC and other regulatory bodies creating such atmosphere for trading, it would be indeed be respite if we could just skirt around the entire tiresome schemer of regulations. I see you’ve got a point there with the mention of anonymous trading. I recently did some research about such brokers that are into anonymous trading who don’t ask you to reveal your personal details. Plus with cryptos not being under any sort of regulatory reins till now I don’t really see the point in handing over your information for KYC which easily run the risk of getting stolen or misused. That’s precisely why I see a growing inclination among traders these days towards this new-wave crop of crypto-fx brokers like Coinexx. Anonymity aside, there is a radical transformation in the way transactions and trades are executed. @charlie.afl And this article about coinexx talks about digital contracts. What are they? Forgive me, I am still a novice on this subject so just want to get some perspective here. Anyone? 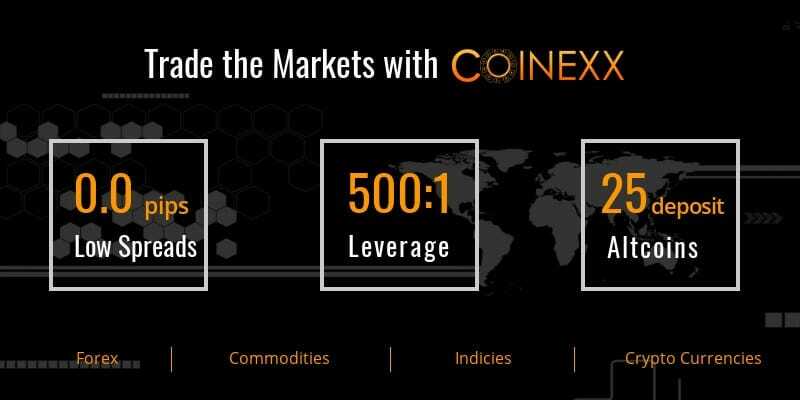 COINEXX.COM rocks and perhaps one of the best concept brokers we have on @Clint list above. It seems that now Finance Magnates agree with me as well. By all means I see coinexx doing everything right it should be done. They are offshore, so no issues of reducing leverage of clients because of stupid esma or cftc rules. They are crypto based so not dependent on banks for bullying them and now they have this “digital contract” as a use case to democratise the forex industry. Another tangent thought: Very few times will you be able to find the director’s informaiton when dealing with forex brokers. So, in a way its good we know who the director of coinexx is.